Jennifer Jason Leigh offers an acclaimed performance as humourist Dorothy Parker, who together with such 1920s luminaries as Robert Benchley, Alexander Woollcott and George S. Kaufman, was a charter member of the legendary Algonquin Round Table. The story is related in flashback form, as Mrs. Parker, in Hollywood to co-write the 1937 feature A Star is Born with her second husband Alan Campbell (Peter Gallagher), recalls her glory days as an Algonquinite. 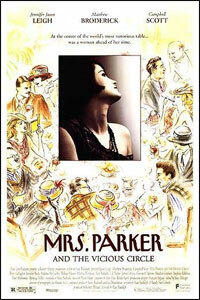 A great deal of attention is afforded Parker's vituperative bon mots, her alcoholism, her self-destructiveness, her suicide attempts, and her affairs with such literary contemporaries as Charles MacArthur (an uncharacteristically unsympathetic Matthew Broderick) and Robert E. Sherwood (Nick Cassavetes). The one person Parker truly seems to care about is humourist Robert Benchley (Campbell Scott), who prefers to keep their friendship platonic. otsoNY Comments: Rudolph shot the film in Montreal because the building facades in its old city most closely resembled period New York City. Full financing was not acquired until four weeks into principal photography. 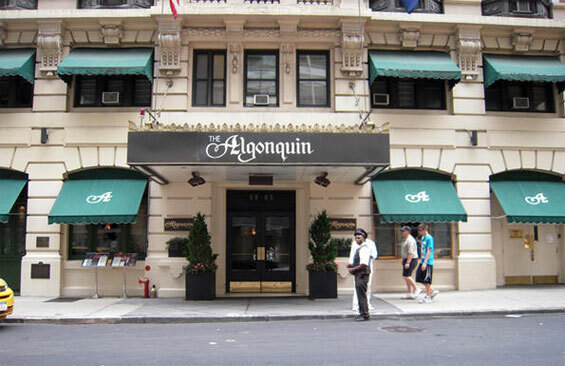 Algonquin Hotel, 59 West 44th Street and 6th Avenue, Manhattan.